*This section explains how the invoices can be archived with respect to different document types. A new button has been added to the Invoice proposal on the action pane. There are two ways to view the archives, one is automatic and another is manual. Automatic archives will be available only when the Invoice proposal workflow is active. Once the user submits the workflow for approval, the archives are generated automatically. When the invoice proposal workflow is not active, then the user should generate the archives manually, by clicking on the Create archive file button on the action pane header. When the user clicks on the button, then the files that have been selected for archiving at the invoicing group will be archived, and a message will be displayed on completion. 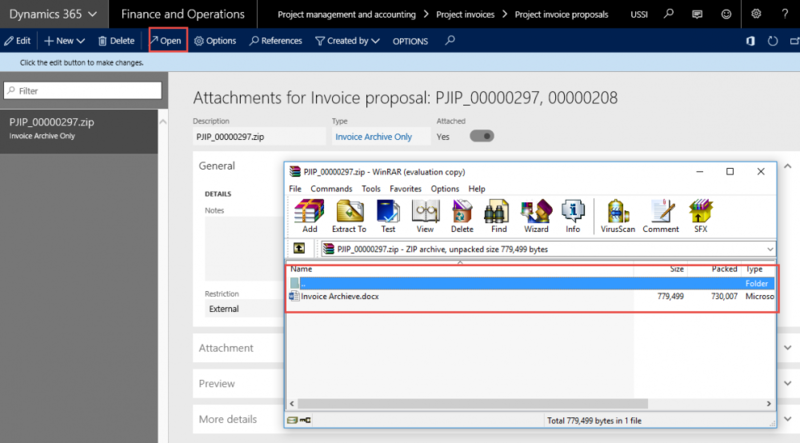 Message – The Invoice archive ZIP file is being compiled in the background for Invoice proposal PJIP_0000XXXX. The zipped documents will be available for viewing when the user clicks on the Attachments icon in the action pane header on Invoice proposal form. When the user selects the zip file in the documents handling form and click on the open button, the contents that have been zipped will be visible as shown in the below screenshot. Once the archive file is created automatically or manually there could be requirement to generate a single file\document for the zipped content. Using the external software program or paid API, these document can be merged into single document. One cost effective solution is to purchase the Adobe software which allows converting documents and images into a PDF. More information about this application and process can be found here. Sometimes the attachments are larger than what can be transmitted by email or emailing ZIP files isn’t possible due to restrictions set on the server side. In these cases, the recommended solution is to setup a SharePoint site per customer and upload the files or documents on that location to be shared. 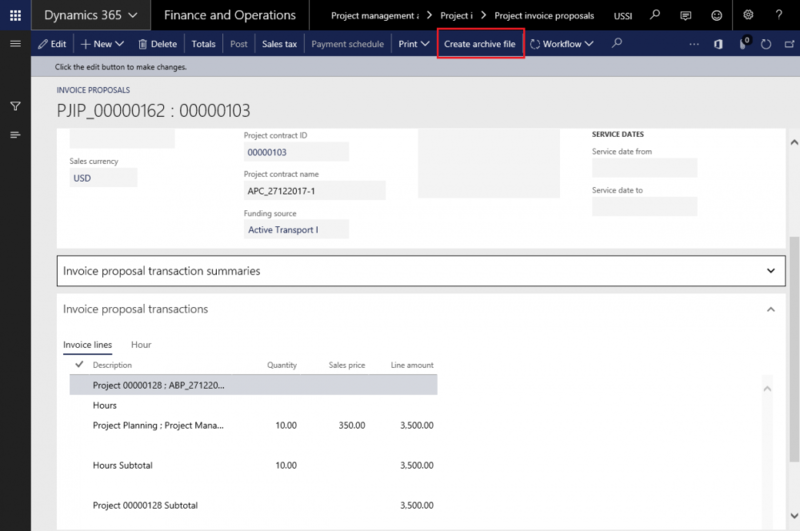 Then the invoice email can include a link to the SharePoint document.